Information on Greek Mythology. Hills of Areopagus. 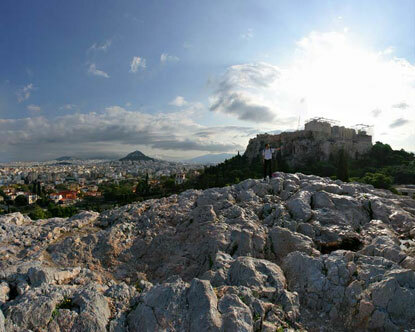 Areopagus is Greek for "hill of Ares" and was an actual location where the god stood trial for murder. Ares was acquitted, but the proceedings were said to be the first judicial gathering ever to take place. The Areopagus itself is a rocky hill, 370 ft (113 m) high, northwest of the Acropolis in Athens It is famous as the sacred meeting place of the city's prime council. This council, also called the Areopagus, represented the ancient council of elders, which usually combined judicial and legislative functions from the beginning. According to the Columbia Encyclopedia, Fifth Edition, "the Areopagus represented in the 5th and 6th century B.C.E. the stronghold of aristocracy. Jurisdiction in murder cases had probably been given to it by Draco; Solon gave it various censorial powers over the officers of the state. The change in the method of choosing the archons in 487 B.C. E.caused the beginning of the decline of the Areopagus. In 480 B.C.E. the Areopagus enabled the manning of the fleet for the battle of Salamis, and it recovered much of its influence in the war years. But around 462 B.C.E. a series of attacks began and eventually the august council was reduced to the status of a court of homicide only, although it maintained its religious character. Pericles was a leader in this democratizing movement; Aeschylus was an opponent, and he brought his trilogy of dramas to a close (in The Eumenides) with an appeal for the preservation of the ancient traditions of the Areopagus."